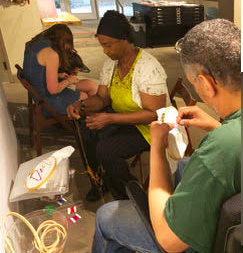 Sunday, July 29 Workshop: Invisible Made Visible 10:00am- Noon. No charge. Pre-registration is required. Artist Melissa Sarris will offer this hands-on embroidery workshop in conjunction with They Made the Cut show in the Gallery. Men from Green Haven Correctional facility were asked to respond to questions about how they see themselves and to allow the outside world to see their humanity and potential. Sarris took their hand written responses and enlarged and printed them on linen fabric. In the upcoming workshop participants are invited to embroider these words. Embroidery stitches will be taught. An informal conversation on the topic of mass incarceration will be encouraged. All materials will be provided (donated by Up-Stitch, Albany, NY). This workshop is limited to 10 participants. All abilities welcome. Register here.